Fuel Up to Play 60 Summit in Cleveland, Ohio! Check out our Milk It Challenge! Our Fuel Up To Play 60 ambassadors recently created a thank you video to Dairy Farmers of Washington! 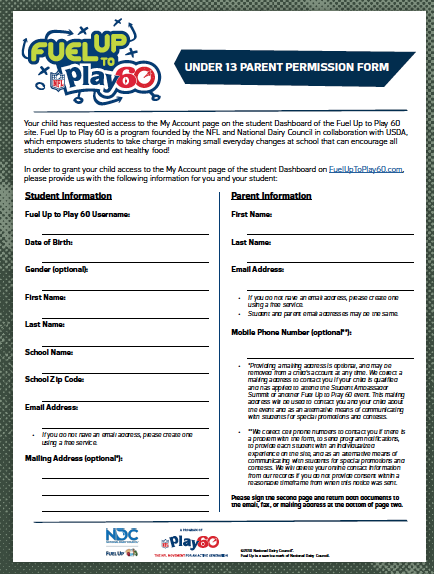 As an interested, committed supporter of the Fuel Up to Play 60 program, you can contribute to your school’s efforts through in-school volunteer work as well as outreach to the community. 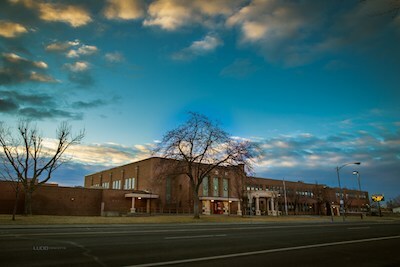 You can assist teams of students in implementing programs, set an enthusiastic tone in the community and work with the school’s parent organization and/or the school board to help secure funding, resources, and volunteers to expand students’ efforts. 4. Most importantly, share your enthusiasm for improving your school’s nutrition and physical activity practices with other parents, teachers, and other potential allies. If your child is under age 13 and has reached Level 3 by earning at least 30,000 Points on their Dashboard, parent permission is needed for them to be named an Ambassador, complete their profile and become eligible to win prizes. 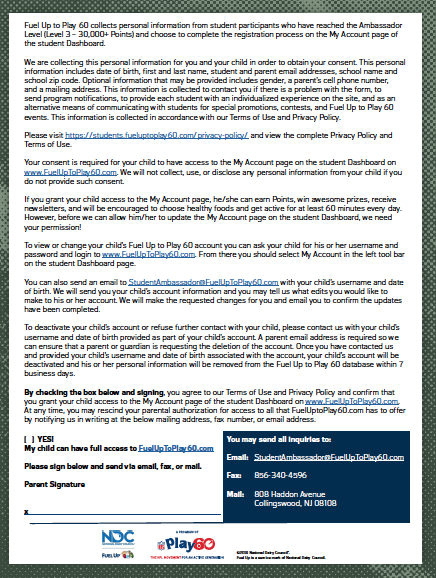 You can download, complete and return a Parent Permission Form (see below).